ONLINE RESOURCES If you search on "Edward Theodore Comegys" using Google, (5-15-04), you will find about five links, all of them appearing to be relevant. Edward Theodore Comegys This page on Michael Patterson's Arlington National Cemetery Website offers a brief biography and a beautiful picture of his headstone. Michael has included a request for more information, so if you can help, please contact him. "Anna M. Comegys, was the great-granddaughter of three of the Revolutionary patriots of this sketch, Alphonso, Nathaniel and Jonathan Comegys. She owned several letters written by Jerome Bonaparte to her uncle, John Comegys, and she was also the proud possessor of an epaulette worn by Col. John Ward at the battle of Long Island. Her grand nephew, Lieut. 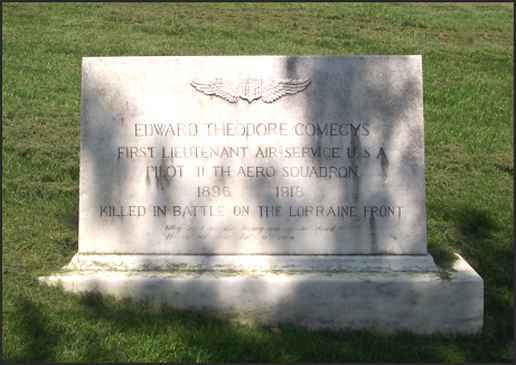 Edward Theodore Comegys, son of Mr. and Mrs. E. G. Comegys, of Washington, D. C., was a member of the 11th Aero Squadron, A. E. F., and fell in action "somewhere in France," during the World War."